With their I-League campaign almost over, Minerva Punjab are focusing solely on AFC Champions League qualification and AFC Cup. The Mohali-based club have made their third signing in recent times. Meanwhile, Gokulam Kerala are all set to sign defender Collin Abranches after Argentine Fabricio Oritz left the club. Vincentian footballer Cornelius Stewart will be joining the club soon as their latest foreign signing. 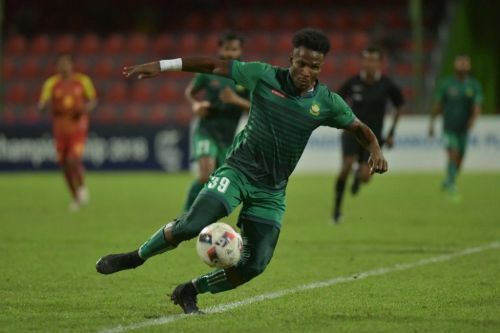 The striker, who has been in terrific form for Maziya Sports and Recreation Club, is expected to take the goal scoring responsibility with his new club. Stewart started his career with youth football team System 3 FC on his home island Saint Vincent. He moved to Newwill Hope International FC. His first stint in the foreign shores came in 2009 when he signed for Canadian club Vancouver Whitecaps Residency. He stayed in Canada until 2013 and played for different clubs within this time. Stewart moved to Finland in the middle of 2013 and signed for Oulun Palloseura. He spent two more seasons at the country, playing for two different clubs. The Vincentian then moved to Maldives and signed for TC Sports Club before moving to Maziya. During his time with TC, Stewart scored 20 goals in 27 matches, helping the club to clinch the title. He was more lethal with Maziya as he scored 28 goals in the last season of Male League to help his club finish in the second position. He was awarded best foreign player after his record number of goals for Maziya. Minerva will be Stewart’s first stint with India. It is yet to be known who he’ll replace in Minerva. Stewart scored 13 goals in 36 matches for his country Saint Vincent and the Grenadines, with the latest coming against Guyana in 2018 World Cup qualification match. Minerva are expected to face a tough test against Saipa FC of Iran in the AFC Champions League qualifier. Minerva have lost to lower ranked Shillong Lajong 0-1 on Friday, in a match where defender Lancine Toure and goalkeeper Bhaskar Roy had to play as centre forwards as all most of their foreigners are injured. On the other hand, Collin Abranches is all set to sign for Gokulam Kerala, another club who are yet to find their rhythm in the I-League. Abranches is currently without a club after Bengaluru FC decided not to renew his contract before the start of this season. Abranches has vast experience of playing in I-League. He played in clubs like Air India, Salgaocar, Mohammedan Sporting, Mumbai FC and Ozone FC before his only season with Bengaluru.